As the clock hits 5pm to signal the end of the business day over at The Board it brings and end to October, and with that, a monthly market update for you. In this report i’ll be covering the same things I did in September Detached Market Report. More new policies were announced and implemented this month, including a Mortgage stress test for uninsured buyers making them qualify at 4.64% and likely removing 20% of those buyers from the market. For a little context, October generally sees a similar amount of activity as September. Full Report below. Just like September, this was the fewest detached sales for Vancouver East on record (last 10 years). The second fewest was 74 in October 2008. Other areas didn’t stack up much better. This was the second worst October besides 2008. Here are October 2008 sales numbers. This chart summarizes the current situation in East Vancouver. 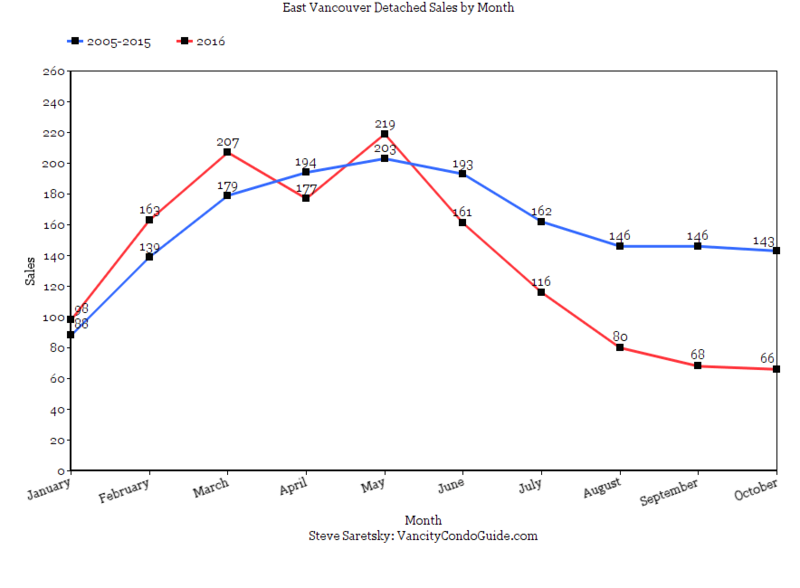 Taking the average sales over the past 10 years (2005-2015) and plotting it on a chart vs 2016 sales shows East Vancouver has been trending well below normal levels for the past 5 months. Vancouver East Detached sales 2005-2015 vs 2016. New listings for the month are lower than they normally would be, except for Vancouver East which was right on par with normal levels. The remaining areas were below normal levels, Vancouver West 28%, Richmond 8%, Burnaby 1%, and REBGV 10% below the 10 year average. As explained by Robert Shiller, Nobel Prize winning economist, people tend to hold onto an investment that is going up in value in hopes of future gains. This likely describes the lack of new inventory coming onto the market. It is my belief the average home owner is unaware of the current housing correction underway. If news gets out it could add more new inventory onto the market. With sales well below normal levels even with little inventory it could get ugly if there is an influx of inventory. Sales to active ratios continue to favour the buyer. October marked the third consecutive month the ratios were below 14%. (As per the board anything under 14% is a buyers market). Months of Inventory show a buyers market for all the areas. As I’ve mentioned before highlighting the average or median price on a month to month basis can be very misleading because it fluctuates so much. Even when prices fell roughly 12% back in 2008 prices fluctuated month to month but when all was said and done dropped 12%. The board has not released their MLS benchmark this month, but even then I wouldn’t expect it to show much change as it can be delayed by as much as 6 months as per my personal observation. For example, it had Vancouver East prices hitting a new high in September. We all know that’s not accurate. Most Realtors will tell you the detached market has dropped roughly 10-15% over the last few months. This is also reflected in the abundance of price reductions. I will try to put together a separate post later this week analyzing prices. The cool down continues in the detached market. We have now been in a buyers market for 3 consecutive months. It’s important to understand it’s only been 3 months! Many people, my clients included, are wondering why it feels like prices haven’t moved much. Firstly, it’s only been 3 months of a buyers market, it will take several more months to being seeing further price drops. With that in mind, we’ve already seen a roughly 10-15% reduction in prices. That’s an incredible number in such a short time. With many sellers still holding out we have yet to see a rush of new inventory hitting the market. Perhaps this is because sellers are optimistic for a turnaround in the spring. With sales at terribly low levels despite lower than normal inventory it shows just how little demand there is. Expect this cool down to continue through the winter months.